As Boston prepares for yet another musical festival with some of the biggest names in the industry—this time, to benefit the victims of the Marathon bombing—an alternative transportation company is offering an extra lift to concert-goers. To give back to the community that Boston Pedicab operators call “their home,” money made from rides to Thursday night’s “Boston Strong” concert, which features performances by Aerosmith, Boston, and the New Kids on the Block, will be donated to the city’s One Fund, and help the victims and families impacted by the April 15 bombing on Boylston Street. “Often times if someone has a tragedy or something bad happens in the pedicab industry, we will pool a portion of our tips and help out. It’s within our culture…so when things like [the bombing] happen, the first impulse is ‘lets do this,’” says Christian Matyi, a three-year veteran of the pedicab industry in Boston. Twenty-four total drivers will be out pedaling through the streets of the city, shipping music fans to the once-in-a-lifetime concert event. Proceeds from tickets sales for the concert are also going to the One Fund, which has raised more than $31 million to date. “It’s been really hard for us. Four or five [employees] were parked nearby. Another cabbie rode through the blood on the streets,” he says. Workers in the industry took the bombing personally, he says, because drivers utilize the path along Boylston Street “30 to 50 times” during each shift. 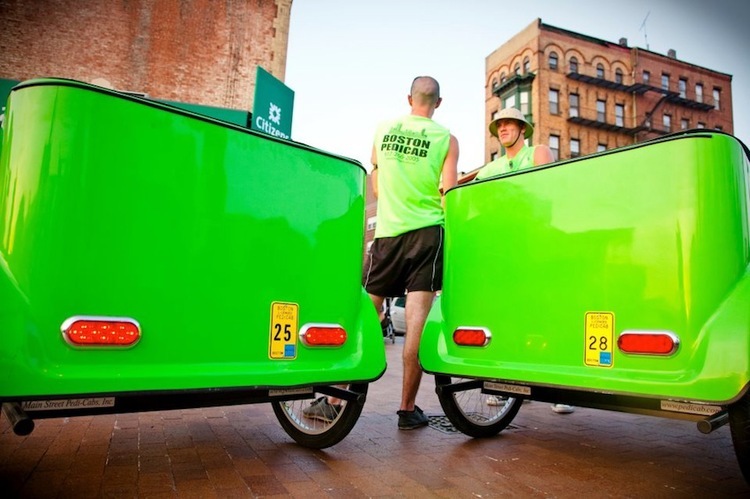 With the area closed down for several days after the blast, as FBI officials investigated the bombing, Matyi says Boston Pedicab saw a dip in business, but employees stayed positive and were reminded by their employer to give back to Boston. Marathon Monday is the second busiest day for employees, just after New Year’s Eve and St. Patrick’s Day. Matyi says he hopes the rides to the TD Garden on Thursday are a reminder to both tourists and locals that they are available as an alternative mode of transportation anytime of the week, but also in times of need. “All we can do is keep pitching in,” he says.